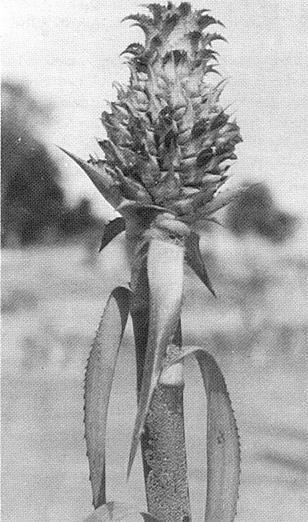 This photograph of Aechmea dichlamydea var. trinitensis was taken by W. W. G. Moir in his garden in Honolulu. Because the camera is not able to show up intense blue, the picture in no way conveys the brilliance of the coloring of this spectacular bromeliad. See page 103 for complete description. When I first began to walk, about the beginning of 1897, I became aware of bromeliads and learned not to touch them because I might get scratched. The first bromels in Hawaii, besides the pineapple, were Billbergia pyramidalis, B. nutans, and Tillandsia usneoides. For some time I knew little of the great variation in shapes, sizes, and colors of these plants. When we first went collecting orchids in the American tropics in 1951, we became greatly interested in bromeliads, but since it requires a 12-month quarantine to bring them into Hawaii, I did not collect any. However, in many an orchid plant were seeds of bromeliads which germinated some time later, and we gradually got the fever to grow bromels. Our garden, Lipolani, is located at about 675 feet elevation in the Nuuanu Valley section of Honolulu. Honolulu is about 20 degrees north latitude and 150 degrees west longitude. We have a prevailing northeast trade wind, but during December to the middle of March we have southerly winds. We have 125 to 150 inches of rain a year, coming mostly in December, January, March, and April. Then again we have it very wet in July and August, so that there are two peaks of rainfall a year. This is true of the valleys and higher elevations but not the lowlands. We have a light cloud cover for a great part of the time. Our garden is completely walled, mostly with concrete hallow tiles turned on their sides, so there is good air circulation and the winds are broken. There are a number of trees, mostly on the windward side, and one section serves as a small forested area. In other areas we have tall Hawaiian tree ferns, Dracaena marginata, and plumerias. The garden is divided into several courtyards, so we have no grass lawn within our walls. The entire area where we now have bromels was originally landscaped with orchids in beds of hapuu fiber on the ground, on huge rocks which we moved in, but mostly on erect fern logs of various heights. These logs were very handy for moving around and for rearranging the planting when the plants got too large or were in too much sun. This moving about allowed us to change the arrangement every so often into a new pattern. A stepped-down walk way from the gate to the house divided the front court-yards, and a low wall separated these from the forested area where we keep the cool-growing plants. We gathered a few bromels, like those mentioned in the first paragraph, and tucked them in among the rocks and logs near the border of the planted area on the north side of the walkway. This was in 1949; the following year we were given a gift of a subscription to the Bromeliad Society when it started. One Sunday while we were working in this front area a stranger looked over the gate, and we invited him in. I did not get his name at first, and after he had made a tour of our garden, we saw him to the gate and he remarked he wanted to send us a plant for the garden. We thought no more about it for we had many visitors to see our orchids, as we do a tremendous amount of breeding in both natural and hybrid genera. A little while later we received a very fine large orchid—a piece of the Laelia purpurata (semi-alba) collected by Mr. Mulford Foster in Brazil and mentioned in his book Brazil, Orchid of the Tropics. Our great benefactor was Mr. David Barry, the well-known bromeliad expert. Between then and his next visit, we had moved all the bromels into a new walled-in area, including "the forest." We had also received seed of several Vriesea hybrids and Tillandsia cyanea from Mr. Foster. We divided the seed, part to be grown in chopped tree fern, and the other part to germinate in agar as orchid seed would have done. There was a large germination in both cases. David returned a year later, and as he could not see our bromels from the front gate seemed disappointed until we showed him the new area. We had acquired many plants of Portea petropolitana var. extensa, Aechmea bracteata (known as the ribbon plant"), several Pitcairnia flammea, and two other Pitcairnia species which were common in Hawaii. From this 10 foot by 15 foot area, we expanded into the forest section, removing the orchids to other parts of the garden. The Tillandsia cyanea grew and expanded to clumps all over the garden, and now we have about thirty large clumps of it, besides having given away many pieces. We acquired Cryptanthus bromelioides from a large flower arrangement, and now we use it as the perfect ground cover. It is planted in a layer of old tree fern fiber, which is the discard from orchid repotting. Gradually we acquired more and more genera and species about which we knew nothing as to how big they grew or what conditions they needed, whether shade or sun, wet or very wet, epiphytic or terrestrial. We now have about 22 genera, and the various colors and shapes of plants on high logs and on low ones and on the ground make a very pleasing color scheme. Little by little we covered the entire area on the north and east side of our garden. Those bromels that needed more shade were grown under native tree ferns and Dracaena marginata. The color of the leaves of Cryptanthus bromelioides, depending on how much sun they got, gave us a colored carpet. These plants are most useful in flower arrangements and can be used in dry flower and leaf arrangements and left for weeks without water and then can be returned to the garden to grow again. Some seedlings we acquired about six years ago turned out to be Aechmea dichlamydea var. trinitensis. We knew nothing about it, not even the name. The plants were placed on logs about three feet high. They outgrew the logs after flowering for the first time with their spectacular spikes of coral and blue. We moved the plants to a terrace about three feet above the courtyard and set them on a bed of tree fern fiber and rocks. We have had two spikes each year, and now in the fourth year of flowering have three spikes. They last for five or six months in beauty. Somehow there is no insect to pollinate them, so we twirl a toothpick in the small white flowers that open for only a few hours each morning. This Aechmea is the most spectacular plant in the garden. Another bromel, almost as spectacular, is Guzmania sanguinea with its fire-engine red leaves and yellow center which flowers about four times a year, All the color goes from the leaves when the flowers are completed, and then a new growth appears from the center. Equally fantastic are the many flowers on Guzmania lingulata var. major. There are several other plants of this species in the garden, but none have the beauty and size of the large form whose flowers are fine on the plant for four months. Many of the species take on colors in the sunshine that are not seen in their habitats in the forest. Billbergia elegans becomes a beautiful grey-purple, and when the pendant pink inflorescence comes in January and February the color scheme is great. Too bad it does not last longer. Aechmea orlandiana, with its intense coloration in the sum and its vivid red bracts and yellow flowers, makes a terrific sight when 25 or 30 of these plants are all in bloom. This also is a winter bloomer. Most of our Billbergias flower then, too, and are placed high on logs so the pendant sprays make a great display. A new acquisition we greatly love is Streptocalyx poeppigii, with its deep red leaves in full sunshine. We have not seen it flower but have seen the species holmesii, which cannot take the sun so well. We could talk about the genera and the ways we have met their requirements, but that would fill a book. We like them all, but have to get rid of the very spiny and dangerous ones, for they might be harmful to visitors as well as ourselves. The Nidulariums start their showy period in March and will last for the rest of the year. Aechmea fulgens, A. miniata, and their hybrid Maginali are always showy in red and blue. Aechmea mexicana with its three-foot spike of white berries puts on a great display, as does A. lueddemanniana with its shiny white then purple berries and its rose-bronze leaves. This one is very easy to grow from seed. Many of these bromels are used for flower arrangements at the Honolulu Academy of Arts where Mrs. Moir does the floral and plant decorations. They are valuable, since they last for weeks and can be made over into other arrangements to vary the display. The garden's best all-round display is in September and October when Tillandsia cyanea is at its peak. We have these blue flowers on the pink fish from July through March. We can tell you only our methods of growing bromeliads outdoors, as we grow them no other way. We find that all broms are hogs for food; whenever they look a bit yellow or more leaves turn yellow than we feel is right, sterile steer manure is used liberally at their root base. Then sometimes during the year, foliar fertilizer is used in the watering by means of a bucket and Hozon connection. A few drops of D. D. T. are used along with the water to take care of the mosquito problem. The pictures will tell you more than we can, so will close by wishing you a fond aloha and come to see us some time. Flowering 5 dm or higher. Lvs. 6-8 dm long; sheaths broadly subovate; blades ligulate, broadly acute, 4-7 cm wide, serrulate. Scape stout, erect. Scape-bracts lanceolate, entire, bright red. Infl. laxly bipinnate, ample, tomentose-lepidote. Primary bracts like the scape-bracts, shorter than the spikes. Spikes stipitate, distichous-fld, linear or linear-lanceolate, strongly complanate, to 16 cm long, 3 cm wide, 5-20 fld; rachis excavated and attached to the sides of the floral bracts. Floral bracts boat-shaped but ecarinate, short-mucronate, 12-15 mm long, strongly nerved, royal blue to lilac like the seps. Seps nearly free, asymmetric about 14mm long, exceeding the floral bracts. Pets white and blue-lilac. Fruit globose, 7 mm in diameter, deep blue. The species is represented in Trinidad by: var trinitensis L. B. Smith Stipes much shorter than the spikes, stout. Spikes bright Delft blue mottled with purple and remaining so after anthesis. Seps with a weak mucro shorter than the wing. In November 1967 we received in Australia a request to supply suitable plants for growing in the buildings of the French Polar Expedition base in Antarctica. These plants were requested as part of the therapy treatment for men stationed there for long periods, as the Antarctic has only exposed rock and a few mossy growths to break the monotony of ice and snow fields. Australia was picked in preference to France, as a shorter travel time would be involved for the plants. The specifications requested green plants that would stand an average temperature of 40-50°F., artificially heated pulsating air, average lighting of 18-20 hours per day including both daylight and fluorescent lighting in winter. Water was to be supplied from fresh melted snow containing no mineral salts. The problem of what plants to supply was passed over to Mr. Paul Waddington, gardener at the Imperial Chemical Industries research station in Victoria. Paul is at present also re-stocking the Arizona Desert with ball-cacti after receiving an SOS from the state of Texas that souveniring tourists had denuded the desert. In choosing the plants Paul kept in mind what plants had survived in the air-conditioned offices at the research station. He included a large selection of bromeliads, as these had featured in his collection of plants for over thirty years and had proved to be adaptable to all sorts of environments. Of the 51 plants sent, 13 were bromeliads, including such varieties as Billbergia nutans, B. × 'Fantasia', Nidularium innocentii var. lineatum, other species of Nidularium, and several Vriesea species, etc. Other plants included a selection of Ficus, Agave, Sansaveria, ivies, etc. The plants were first packed in charcoal to absorb the respiration moisture and also to release moisture to the plants. They were then packed again in dry peat moss and surrounded by a poly-styrene liner. The plants left Australia on January 6, 1968, on the Thala Dan. The expected travel time would be seven days. Paul's instructions were to admit air to the plants only once on the trip for a very short duration. Upon their arrival in Antarctica the plants were to be opened only after they had come to room temperature and then they were to be immediately washed in warm snow water. The fertilizer was to be mainly Aquasol and trace elements. The plants were to be potted in a charcoal-peat mix and surrounded with pebbles. They will form the centerpiece in the main dining and relaxation room. Paul expects to receive reports and photographs of the plants installed at the base in February 1968, when returning members from Antarctica pass through Melbourne on their way home. No more zealous advocate of the bromeliad cult exists than our trustee form Australia, W. B. Charley, Esq. From the time he first joined the Society in 1957, he has been an indefatigable worker for the organization besides becoming a grower of considerable merit. A rancher, born and bred in the great open spaces of Australia, he has lived all his years close to growing things —his cattle and sheep, his crops and his nursery of ornamentals. He resides in the Blue Mountains, 70 miles west of Sydney, but spends much time on his ranch 100 miles farther inland. His interest in bromeliads was aroused in 1957 when he sold some tree fern to a man who was importing bromeliads from the United States. When he saw how effectively bromeliads could be grown on tree fern trunks, he decided to grow them himself. Mr. Charley at this time was a supplier of cut and growing tree fern, which he sold to orchid growers. 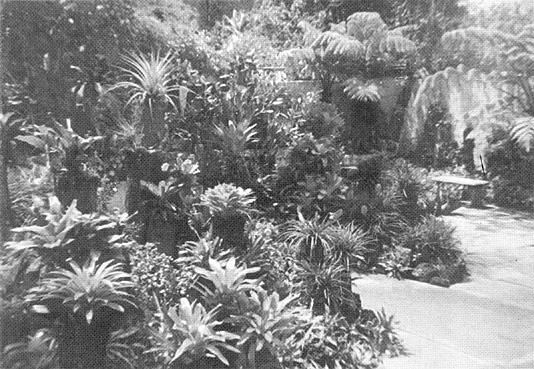 He built a glasshouse, secured a number of bromeliads which he planted in tree fern, and before long the bromeliads were "romping" all over the place. He heats his house only in winter nights or on days when snow is falling. At the moment he is working with a commercial pineapple grower in Queensland on mutations. He says that some of these are showing great promise as pot plants, many being very colorful and staying true to type, the virus being hereditary. If you are ever in Sydney with a passion to view these wonderful Broms enmasse, you should inquire of the Trustee of the Bromeliad Society, Inc., in Australia for directions. There is only one such place to go. Most growers have a couple of the variegated pineapples, some have none, but there is one grower who has a "blow up" of hundreds of the most perfectly grown Ananas bracteatus variegatus probably in existence. If one is sensitive to intense heat, he would probably hesitate to enter the large hothouse at Mr. Bill Bewley's Indoor Plant Nursery at Epping, N. S. W., for once inside the scalp seems to lift and prickle, sweat streams out of every pore, and one may as well be in a Turkish bath; but if you are really keen, you stay there to view the lush growth on these plants which reach the roof on shelves in strong light. We are generally pleased to see one or two offshoots appear on our plants, but here there are at least from 10 to 12 striking out from above and below the fruit, besides many coming from the basal leaves. Usually we see a pink flush over the variegated leaves, but here every plant is entirely covered with red. Fruit seems to sprout up in plants not yet mature. What a wild splurge of colorful growth! 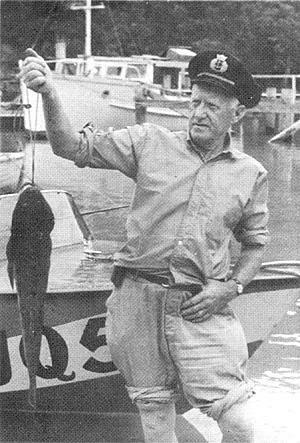 One would feel confident that to get a small sucker out of Mr. Bewley would be simple, but no amount of begging, arm twisting, bartering, etc., can produce one. Mr. Bewley is not greedy, but he knows that no one has enough stock of this plant to produce a lot for a hungry variegated pineapple demand. If he let loose, very soon he would have none. Mr. Bewley has now uprooted and has gone to the Blue Mountains along with his large collection of these plants. Some confusion seems to exist as to which bromeliad is A. bracteatus var. variegatus and which is A. comosus var. variegatus. The former has more lineal white stripes in the blades, while the latter has margins only of white. It is to be found in a pineapple plantation in the North growing with the ordinary commercial variety (Ananas comosus) and is said to be the same except that it is affected by a virus. Both kinds take on a pink or red blush all over in good heat. It is a rarity to see an Ananas in bromeliad collections that do not have kinked leaves, and this seems to be accepted. In reality this kinking is a form of the "wilts" and shows a deficiency which is characterized by eventual root failure and plant decline. This deficiency is due to a lack of acidity in the soil and water, which must be no less than Ph5. Copper, zinc, and iron trace elements also could be lacking. A complete fertilizer must be used regularly to maintain good growth. A perfect Ananas has stiff, strong leaves with no droop at all. —Bilpin, N. S. W., Australia. To many people Colorado would not be the most likely place to grow bromeliads. Our dry sunny climate is very pleasing to humans, but tropical plants do not always thrive here. One soon discovers that the books and general cultural information on bromeliads is not for conditions such as ours. My purpose in this article is to point out some of the procedures that I have tried and the results I have had in growing bromeliads in this difficult climate. The most serious problem is the low relative humidity which averages 17% outdoors and 7% indoors. We also have a high intensity of sunlight, and rapid fluctuation in temperature the year around. Before I had my greenhouse I kept my first bromeliads in the bathroom, for I was sure they would not survive in the other parts of the house. They still dried out very quickly, so I put them in the tub and showered them daily. As more plants were acquired, some of them had to be moved into other rooms, and I was amazed to see them go right on growing. It soon became apparent that either the plants had to have a house, or we would have to build another for ourselves. After finishing the greenhouse last July, I found that caring for my plants became much easier, and the humidity was easier to maintain with a low of about 30% except in very cold weather. At first, not having the proper humidifying equipment worried me, as I had built the greenhouse with only the help of a contractor to mix and pour the concrete and to put up the frame. I was told earlier that I could not have a greenhouse as it would be too expensive. Later I was told that if I could pay for the material and the necessary help out of my budget, I could go ahead. This meant that I would have to do most of the work myself. I quickly learned how to put in glass, etc., but that is another story in itself. Getting back to the plants—they actually seem to like to dry out a bit for short periods of time. Among my first mail-order shipment of plants was Pitcairnia andreana. At the time I was sure that it would never make it, but it has grown to be a beautiful plant and it thrilled me in early April with its bloom. Although I have nothing to compare my plants with, they seem to measure up favorably to the descriptions in the books. I realize that Billbergia pyramidalis is a very common type, but if you had never seen one before you might have been as thrilled as I was when it bloomed the first of April. Most of my plants have not bloomed yet as most of them were bought as juveniles, some locally and some by mail. I have 40 different species at this time and will add more as I can. Three plants were lost right after they arrived by air mail, and I am not sure what caused them to die. Some of my plants are in bark and a few are on fern slabs, but the majority are in a well-draining mixture of light potting soil, perlite, and pieces of bark. It drains properly but still keeps enough moisture to last 24 to 36 hours. The plants on slabs and in bark dry out extremely fast and I try to keep them in the most humid area. Colorado is well known for its clear air and very bright sunlight with the light even more intense when reflected off the snow in the winter. Although the sunrays are directed at the earth at a steep slant in the winter, our sparse atmosphere does not filter them enough to eliminate the need for shading. One problem I have not had is any type of fungi for obvious reasons, and algae don't seem to have a chance either. We seem to have insects with no taste whatsoever. With all the delicate ferns and soft leaves on a few of the bromeliads, mealy bugs prefer my little son's cacti, and every once in a while scale seems to find its way to my Ananas comosus. I have been lucky so far. The temperature fluctuates fifty degrees between day and night most of the time, and the plants seem to appreciate the change as much as we do in the summer. I believe that with some changes in cultural procedures, bromeliads can be the answer to those people living on the high arid plains who want a touch of the exotic in the way of plants. An interesting side light to the culture of bromeliads is the recent development by the William H. Rorer Company of a drug derived from pineapples. Ananase is the registered name given to a concentrate of bromelians, proteolytic enzymes found in the pineapple plant. Ananase is an anti-inflammatory enzyme which reduces edema, eases pain, speeds healing and tissue repair. Its action is described as follows: The swelling at the site of the inflammation is thought to be caused by fibrin deposits, which block small blood vessels and pores. Ananase appears to break down this fibrin barrier sufficiently to open fibrin-clogged lymphatics, capillaries, blood vessels, and pores. Tissue debris is removed and repair begins. While considered to be safe with few toxic side effects, Ananase should be used with caution where abnormal blood clotting occurs, such as in hemophilia, hepatic or renal disease. It is obtainable only by prescription. Why not surprise your doctor by talking "bromeliad drugs" on your next office visit? Ananas do indio, nomen vulg. INFLORESCENTIA e centro foliorum emergens, dense strobiliforme spicata; spicis terminalibus concretis, comosis; foliolis scapalibus paucis, subamplexicaulibus, spinis validis, incurvis, 10 nun distantibus ornatis, basi coloratis; bracteis inferioribus et mediis interne glabris, subtus viridibus, supra sordide rubris, externe bene albo-squamatis, quam petala 2 mm minoribus, optime spinoso- serratis, spins 1-2 mm longis, apice pungentibus; bracteis superiobus sterilibus, numerosis (plus minusve 50) comam formantibus. FLORES 30 mm longi; sepalis liberis, carenatis, petalis usque medium amplectentibus, 8 mm long., dorso albo-squamato subornatis, apice obtusis, petalis subtus albis, supra violaceis, 18 mm long., erectis, ligulis binis fimbriatis 3 mm long, supra basim ornatis; staminibus 6 mm petalis minoribus, tribus petalis oppositis inter squama retentis, antheris apice longe acutis, basi sagittatis, bruneis: stylo antheris 2 mm majors, ovario infero fete apice placentifero polyspermo. FRUCTUS citrinus, carnosus, edulis, perdulcis, vinosus, colore et. sapore carnis succosa ab A. comoso maxime differt; seminibus nullis. TERRICOLA, florifera, 0,8 m alta. FOLIA atro-viridia, supra glabra, subtus furfuracea, spinoso-serrata, spinis 10 mm distantibus inter se, 3 mm longis, incurvis, aequalibus, 1,40 m longa, 6 cm in medio et ad basin 5,5 cm lata. Typus - Aguas Emendadas, Brasilia, D. F. Campo cerrado. Leg. P. R. Reitz 7040 (1.X. 1967), HBR. Muda trazida de Aguas Emendadas em janeiro da 1965, cultivada am Brusque, S. Catarina, onde floresceu em outubro de 1967. Foto em preto. Ananas ginesio-linsii, which I herewith present as a new species of the common pineapple (Ananas comosus), was discovered by me by mere chance on an excursion of the participators of the XVII Congress of the Botany Society of Brazil, held in Brasilia, Federal District. Habitus of Ananas Ginesio-Linsii Reitz showing a spike in full bloom. Photo taken in the Municipal Park in Brusuqe. Showing spines of scape and floral bracts. On January 6, 1966, we visited a place called "Aguas Emendadas" (meaning "the coupled waters") in the northern part of the Federal District not far from Planaltina. The name of the place was derived from a geographic curiosity of the site. There is a great highland bog on the plateau; its waters run into the three largest Brazilian river systems: the Amazon Basin, the S. Francisco Valley, and the plains of the Parana River. In the neighborhood of the wide swamp, the botanists happened to come across what is locally called an "Indian planting" (roca de indio), an extensive patch of one single vegetable not rare on the prairies (cerrados) in the states of Goias and Minas Gerais. The plants we found covered quite a large area in the midst of spiny twisted scrub characteristic of the region. To me it looked like an abandoned plantation belonging to a farm. 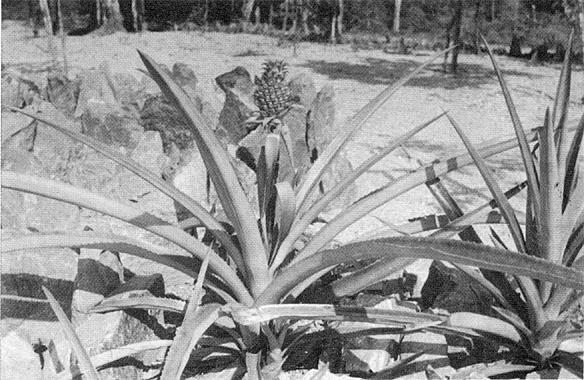 But the botanists explained there are many such assemblies of Indian pineapple in the cerrado and that it is thought they are abandoned plantations of the original inhabitants of the locality. The planting in question covered several acres. We collected many ripe pineapples. Their sizes ranged from 10 to 17 by 6 to 11 cm. The outstanding difference between A. ginesio-linsii and A. comosus, which can be seen at a glance, is in the spines of the leaves, the scales of the stem, and the flower bracts. In A. ginesio-linsii the spines on the leaf-and-scale edges stand 10 mm apart, while in A. comosus they are spaced at about 4 mm. The floral bracts in A. ginesio-linsii have many large spines, while those of A. comosus are merely serrate. The tuft of sterile bracts on the top of the fruit of A. ginesio-linsii is made up of about 50 small leaves, many more than in A. comosus. The new species is named in honor of Congressman Ginesio Miranda Lins, a banker from the state of Santa Catarina, in recognition of his endeavors on behalf of botanical activities in his native state. He was present at the founding of Herbarium Barbosa Rodrigues and has been instrumental in furthering its scope. The type is part of a plant cultivated in the Municipal Garden of the town of Brusque, S. Catarina, with cuttings brought from Aguas Emendadas, in January 1966, from the Federal District in Central Brazil. —Herbario Barbosa Rodrigues, Itajai, S Catarina, Brazil. Please note Guzmania quitense on the back of Issue No. 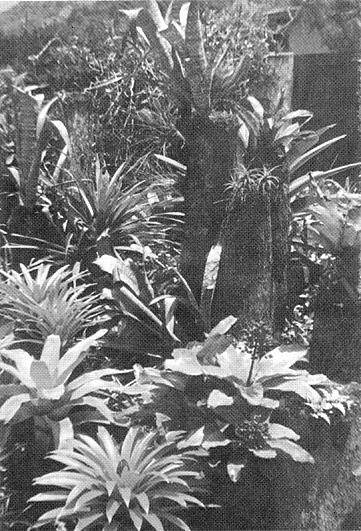 5, 1968, is the local name for this bromeliad. Rightfully, it should be called Guzmania melinonis. An indispensable facility for accommodating my ever-increasing numbers of bromeliads is the hanging pot holder that has a hook at one end and two 20-inch arms ending in clamp-on clasps. From the damps one can, in turn, suspend other pots. My glasshouse is ten feet high, and I have room for five tiers of plants. The bottom row is hung double. Culturally this is advantageous, for in such a suspended state, there is nothing to block air movement completely around the plants as there is when they are placed on benches or steps. My glasshouses both have two one-inch parallel pipe braces running the full length of the house and attached to the end walls. Additional reinforcement is given from arms of pipe extending out from a strong central vertical pipe. Because of the sturdiness of such construction, hangers have been hung from rings of heavy aluminum clothesline wire placed around the pipe. By suspending successive rows of pots, one may form a double drapery of plants, thus enabling him to walk intimately among his plants. This method of growing has a further advantage of permitting the optimum placement as to light requirements. Those bromeliads demanding strong light exposure may be placed close to the roof, while those preferring a more subdued environment may be placed lower. If a porous humus material, such as peat or bark, is scattered on the ground, little splatter will result; also, there is little fear of pot contamination from the ground. For me, this is the most fortuitous use of space, as, otherwise, I could not accommodate nearly the number of plants I do in the same house. Unfortunately, the pot hangers are made of galvanized steel, and this material will often cause foliage "burn" wherever the leaves come in contact with the steel. I have used an ascetic acid wash—vinegar will do—and this reduces some of the damage. Recently some of the hangers were sprayed with an aerosol can of gilt. It remains to be seen how satisfactory this may be. However, I have found coating with asphalt paint to be very satisfactory. This paint is available in two colors. The black is thick and makes a rather heavy coating which when dry may chip off if there is unusual strain on the steel wire. The gray is thinner and adheres more tightly. Painting isn't half the chore it sounds. If one tries to complete the operation all at once, it will prove to be a messy job, but if he will plunge the hooked end into a gallon of the paint and then hang it up to dry, and two days later plunge the lower part into the can and brush up to the line of the previous emersion, it is easy and relatively clean. Do not use the hangers until they are thoroughly dry or the paint may rub from the hook. In order to start at the very beginning I would like to preface all details that are to follow with a few considerations about the importance of a correct general attitude towards bromeliads on the part of the cultivator. In the first place, every grower of a bromel and everyone who is going to deal with these plants should bear in mind that bromeliads are tropicals and that they should be treated as such. It means that they have definite temperature requirements. The amount of warmth they demand varies depending on the climate they come from. Their adaptability in this connection is often remarkable. Actual temperature in degrees will be given later. Like all other plants, bromeliads need light. We should not treat them as we would a piece of furniture, placing them where it suits us, at least not if we expect the plant to thrive, to grow, and to bloom. We cannot count on that to happen in a dark corner, away from a window. A place in the window or near it is always right. Only direct southern windows getting much sun are unsuitable for certain species. The leaves of most bromels form a funnel; it is a natural water deposit for use in period of drought the plants must live through in their homeland. They depend on the water accumulated in the funnel; they live on it, even in captivity—what I feel tempted to call the inside of a human habitation as compared to the great outdoors. What happens there may benefit the plant, but it may also destroy it. One can almost say the same thing of cultivation indoors. Care and good cultivation tactics can make a plant thrive, but they can also kill it. How many times have I seen it happen that even the most detailed instructions are of no avail if their application is not geared to the individual plant! We should always remember that a plant is a living being; it breathes, it rests, it is thirsty or hungry. Dealing with my fellow humans I divide them into those who comprehend this and act accordingly and those who will not or cannot understand. Special attention should be devoted to watering. It is correct to say that a certain bromel should be watered every two, three, or five days. How often a plant should get water depends on many factors that influence the plant. We cannot explain them all at this stage, but the term "conditions of environment" covers what affects the plant and thereby determines its inner and outer development. These factors apply primarily to the wild plant, but in a certain sense and with diversification also to the surroundings offered indoors. Alongside water in the funnel, or rather the water in the leaf sheaths which should always be present, all bromels love humidity in the ground, but on the other hand they do not like the ground to be soggy or too dry. By far the majority of bromeliad growers cultivate their treasures in pots. This practice in no way exhausts the bromels' inborn possibilities to serve as ornaments. If I submit my predilection for these plants to rigorous scrutiny I must admit that it was their epiphytic way of life that prompted me to give them close and intensive attention. Their peculiar shape and their intricate way of life enthralls me to this day, and I know others have experienced a similar feeling. The possibility of cultivating a bromel as an epiphyte, even indoors, better still in a window, certainly is a challenge to the plant lover. The arrangement provides a decorative feature and permits study at close hand of progressive development. Some species of bromeliads are extraordinarily hard and resistant. A friend of mine living in Bern cultivates a number of species during the warmer months on a protected southern balcony with great success. You may comment that Switzerland is situated considerably further south than Germany and that it has a different climate. Of course this is true and plays its part. I deeply value sunshine and appreciate how much it can do for a plant. On the other hand, I am convinced that in Germany as a whole an equally beneficial climate prevails in many spots that would permit similar results. But I must stress the fact that a compatible environment is a prime necessity and further that only bromels coming from certain climates will be able to adapt. Bromels from the rain forests are unsuitable, but those that normally live in deserts or in semi-deserts (those that are used to a hard life) will do well in the open. In the beginning, it is necessary to make the plants get used to their new life and the greater light intensity little by little. But the bromels like it; they, put on better color and grow up more compact, if slower, than indoors. As a gardener I have experimented in various ways in this connection. Neoregelia hybrids were cultivated from the end of May to the end of September in an "early box-bed" without glass. Entirely unprotected cultivation outdoors did not seem advisable in the rather rough climate of my hometown; the sides of the boxes offer at least a little protection. The plantlets continued to grow satisfactorily and showed—especially as the nights got cooler—a tendency to darken their leaves intensively towards violet-black. The dark coloring remained for some time after the plants had been removed to the glass-house as night frosts set in. Some of the plantlets that had been left out in the boxes on purpose perished of cold only when the temperature dropped to 3 degrees C below zero. The hardening influence of the outdoor summer must have played its part. The same cultivation process was tried with different Billbergia and Aechmea species. Most of them proved quite resistant. Some did not change the color of their leaves, but growth was stouter and shorter—hardier all over. Good results in the open were also obtained with Tillandsias. We know that some species come from high mountains where the climate is harsh. This kind of treatment, though, would certainly harm any characteristic tropical plant. Experiments of this kind, and their conclusions, are of a comparatively recent date and in no way as yet common knowledge. It might entice a plant lover to carry them on. Bromeliads have found two different ways to insure species-survival. The issue of side-shoots seems to be the more primitive solution: it takes care of direct continuation for one thing and also allows for spread, but only within limits. A much more efficient way of diffusion is reproduction by seed. Seeds are generally abundant. In this case, however, two factors of insecurity loom ahead: maturation of seed takes time, and it must combine with the prevailing peculiarities of the climate. As was explained in previous chapters, seed cannot germinate during the dry period. It must be ripe while moisture is still available. Besides the hazard that not every flower gets pollinated, dangers of various kind threaten advanced phases of fruition. In addition, nothing guarantees that a sufficient percentage of seeds will have a chance to germinate. Since a bromel-shoot flowers only once, the inability inherent in its systems to repeat the process the following year like other plants do, is compensated for by the issue of side shoots. Probably the majority of pups can flower within a year of the bloom of the mother plant. This applies to conditions prevailing in the plant's homeland. I must admit, though, that as yet no research on the subject is on file. In cultivation most of the plants take more time to develop an independent offshoot in condition to bloom. Briefly the conditions described show that two ways of development can be made use of. One is the quicker and surer means producing one or more pups which soon flower and produce seed; the other is the possibility of diffusion on a large scale by seed, entailing, however, a longer development from germination to bloom. Both processes hold great interest for the grower. Multiplication by off-shoots insures prompt and foolproof reproduction of a limited number of plants. It enables the grower to perpetuate a rare species from which it is difficult to obtain seeds, since the majority of bromels are self sterile. This means that two or three specimens must flower simultaneously if fertilization and fruiting are expected to occur. Perpetuation of a spontaneous mutation that may seem worth while can be processed in this manner. It applies also to the preservation of exceptionally beautiful crosses that might vary if they were multiplied by seed. 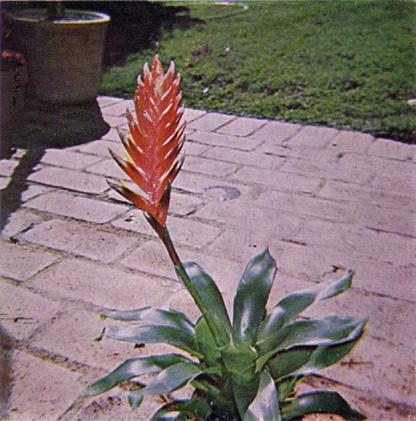 No other ways of propagation exist in the bromeliads. Raising large numbers of seedlings is no problem when seed is available, self-grown, or imported. In cultivation multiplication by seed is the only way to achieve new results. Sometimes it may also be the only possible way of spreading new hybrids over great areas. Some countries, as the United States, have put in force rigid plant protection measures that are a menace to certain species no matter what their age may be. Delicate plants do not survive the harm inflicted by fumigation. Of the two forms of multiplication I prefer reproduction by seed. It will be discussed in the following chapter. JAMES C. BROOKS, M. D.
During the past eight years in gathering data on epiphytic plants in the states of Georgia, Florida, and Alabama, I have found two species of Bromeliaceae quite removed from their published northernmost ranges. This paper will report on these two species. The exact localities are not given for conservation reasons. Tillandsia setacea Sw. is locally quite abundant away from the immediate coast in southeastern Georgia. Several stations of significance in the Okeefenokee Swamp in Georgia have been found. The most surprising find, however, was the occurrence of this little Tillandsia in central Georgia. On January 16, 1962, this species was found growing on cypress and Nyssa trunks about four feet above the water line in Ben Hill Co., Georgia. This location is about forty miles from the colonies along the coast. A careful search in other cypress swamps in the same vicinity failed to reveal any specimens of T. setacea. A visit to this locale in 1968 showed the colony to be still extant. All plants were growing facing south-southeast. On July 13, 1963, while I was carefully searching for epiphytes along the Oconee River in Laurens Co., Georgia, over 100 miles from the coast, an excursion into one of the many cypress pools or swamps produced essentially the same finding as in Ben Hill Co. These plants were much scalier and more compact than those in extreme southeastern Georgia. One of these plants has survived every winter in Macon, Georgia, growing near a fish pool, has bloomed the past two years, and has actually enlarged by vegetative means. The temperature plummeted to near zero in two of the winters. By far the most interesting discovery of all has been the occurrence of Florida's showiest Tillandsia in the state of Georgia. On November 24, 1965, while I was pushing through the tangled brush and swamp in Camden Co., Georgia, I noted a small stand of a bromeliad quite different from T. utriculata growing in rather dense clusters on several species of trees. No specimens were in spike. 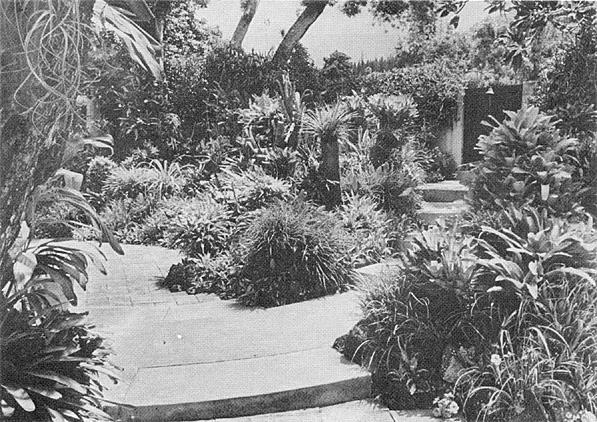 A fallen trunk with two plants attached was removed from the area and placed in the writer's conservatory. In the later winter and spring of 1968 one of the plants blossomed affirming the original suspicion that this was indeed Tillandsia fasciculata Sw. and was growing almost 250 miles north of its published range. The spike was open, red-bracted, and lavender-petaled. No visits to the locale since late 1966 have been made, and no flower spikes have been observed in the Camden Co., Georgia, colony. It is interesting to note that several Yucca species have been seen growing in the fertile crotches of Live Oaks in that area and these have on several occasions been mistaken from a moderate distance as Tillandsias. There is reason to believe that Tillandsia recurvata may eventually turn up and possibly that Tillandsia simulata may someday be found. Extreme southwestern Georgia may hold these two species. The secretary earnestly calls your attention to the fact that the Society cannot be responsible for issues of the Bulletin that are not delivered because notice of a change of address did not reach her in time. A full six weeks' period must be allowed for this change to go through. The bulletins usually are mailed on or about the first of February, April, June, August, October, and December. 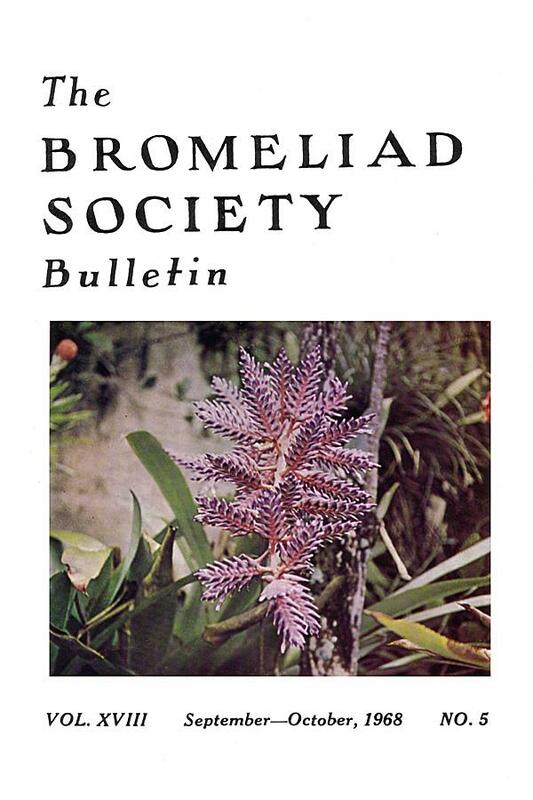 The Bromeliad Society is definitely a non-profit organization, and at the present time, the price of membership does not cover the cost and mailing of the bulletin. The members are therefore asked to cooperate in every way by helping to cut down the rising costs. No second bulletin will be mailed unless the request is accompanied by one dollar. Members are also urged to write their addresses so that they are legible. Many bulletins go astray because the handwriting cannot be deciphered. It will soon be Christmas time again and gift giving will become the problem of the day. Why not give your plant-minded friend a membership in the Society—or, better still, the membership plus BROMELIADS IN COLOR for the special price of $10. The book and an issue of the bulletin will be gift wrapped and mailed to your friend in time for the holiday season. Just send name and address and check to the editor, 647 South Saltair Avenue, Los Angeles, California 90049. A cross between Vriesea barilletii and Vriesea incurvata made by Leon Duval, it was first described in the Revue Horticole in 1894. Aside from its bright gay inflorescence, measuring approximately 3 by 5 inches, much of the charm of this Vriesea lies in its size. It is a chubby little plant, not taking more than ten inches of shelf space. Its soft green leaves of good shiny texture are about 6 inches in length and about 1½ inches at their widest part. The inflorescence rises about 1½ feet above its nest of leaves. The inflorescence lasts in color for several months. The plant is generous as to offshoots. Where space is limited, and even if it is not, this little charmer is a plant to consider.